Wooden coasters rolling stock has evolved a lot since the last 100 years. From the days of the “Scenic Railway” where an employee rode aboard, serving as the brakeman and controlling the speed of the train to today, where wooden roller coasters can go upside down, it has been a fascinating journey. The Philadelphia Toboggan Company (now known as Philadelphia Toboggan Coasters Inc./PTCI) was founded in 1904 by Henry Auchey and Charles Albright. They were involved in wooden roller coaster design and construction, Carousel, various spinning rides and building roller coaster cars. 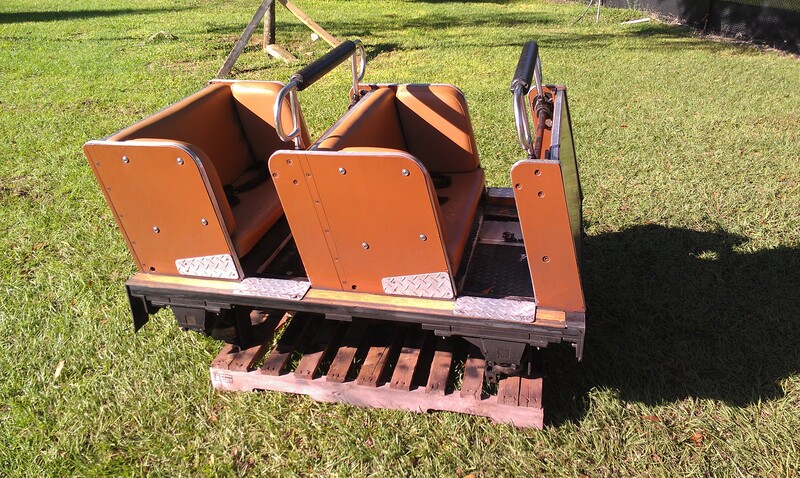 Once John Allen retired in 1976 and other contracted projects were finished in 1979, PTCI left the wooden coaster design/construction side of the business and concentrated on building quality roller coaster cars. PTC trains evolved to the current shape in the 1960’s-1970’s. They were originally offered in a configuration of 2 rows per car, 3 rows per car and 4 rows per car. Some models didn’t have any active restraints. They only had a fixed grab rail and a seatbelt. Then, as the rides got bigger and wilder, PTC invented the “handrail restraint”. The handrail is normally an electrically operated double bar that is mounted near the front of the seating area, over the riders knees. Then, once they are activated by the ride operator, they pivot down into a fixed position and secure both riders at once. The part that rest on the riders is padded and thus, is very comfortable. It also allowed fast and efficient operation, as the seat belts were eliminated and the ride operators only had one bar per row to check. Those bars were retrofitted later to many older wooden roller coaster cars. 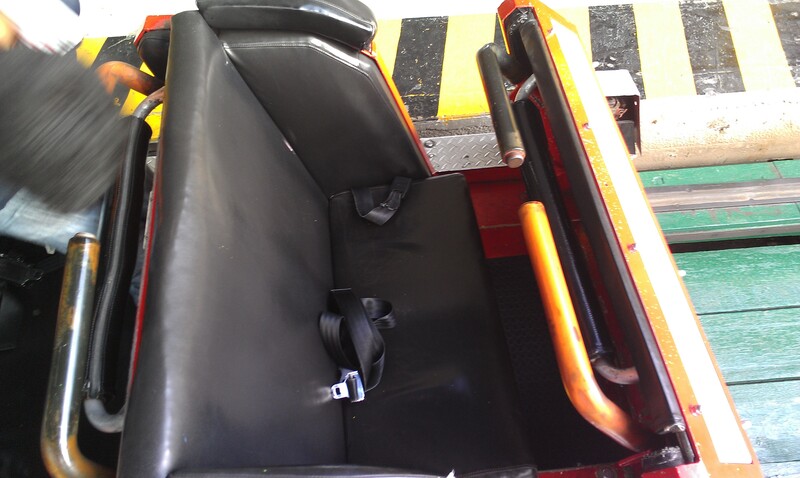 Around 1990, at the request of Six Flags, PTC came up with their own individual restraint design. Adding a mechanical box to the side of each near the foot well, some of those were operated by electric solenoids, similar to the hand rails they replaced. Then, the standard became mechanically operated. Plungers mounted under the station floor go in horizontally into the boxes and release the restraints. An interesting feature is that when the springs are pressed in, the lap bars can be released up, but cannot be pulled down. Then, as the plungers go out, the riders can pull the restraints down. The lap bar originally started as a form covered L metal tube. Around 1994, PTC offered the option of including a L shaped loop to the top of the restraint, in order to prevent riders from standing up during the ride. Most parks now feature the looped bar. On the left is the restraint with the loop. On the right, the simple L bar with a small handle so ride operators can easily pull them up to verify them. The seat divider is the solid model. 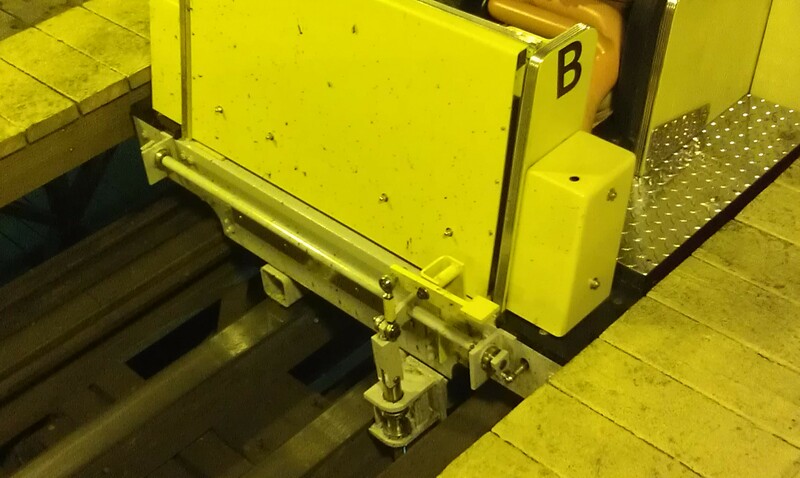 The manual release of the bar involved a metal key that the ride operator screw into the side box and then pull up, releasing the bar. Around 1990 as well, PTC started marketing head rest upgrades to their trains. The first generation head rests were foam covered metal frames, similar to the ones present on convertible European sport cars. 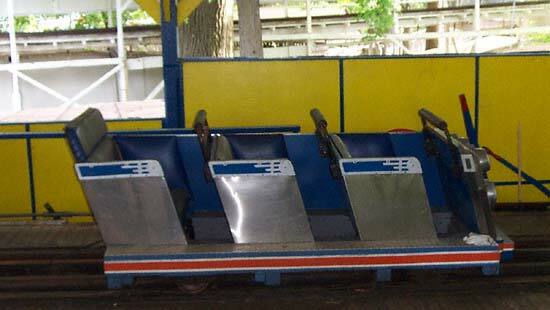 Later, parks like Kings Island added a leather covering to those, to make them more comfortable. Around 1996, at the request of Great Coasters International and Six Flags, PTC came up with a higher padded seatback. Those replaced the sport car head rest and are provide a more comfortable experience. The White Cyclone at Nagashima Spaland (Kuwana, Japan) trains were replaced betwen 2013-2015 and the new ones featured the open seat divider, padded leather seat bottom cushion and sides. The back portion was a molded foam that extended above in a headrest similar to the original PTC headrest. Another view of those headrests. 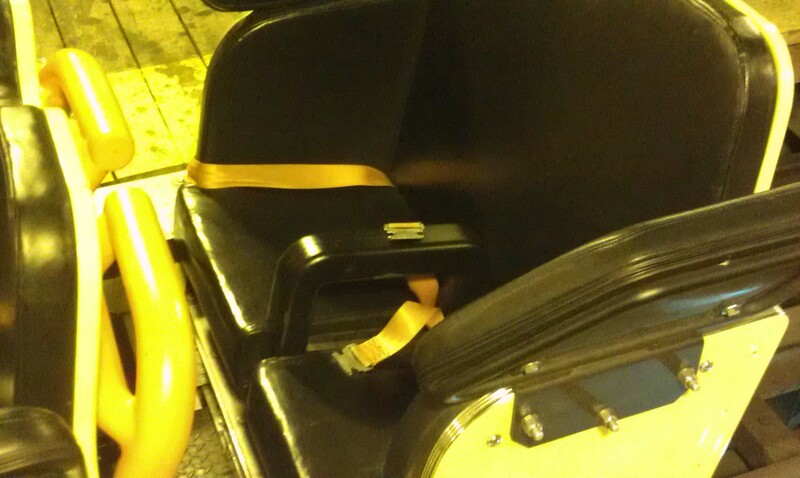 This picture show the combination of the classic handrail restraint combined with the higher seatback. In 2000, two brand new PTC trains replaced the Morgan rolling stock on the Cyclone at Six Flags New England (Agawam, MA). Due to the fact that the Morgan restraint release bar in the station is between the running rails, PTC had to reconfigure their trains. A vertical metal tube is mounted in front of each car and that bar has a small horizontal pipe pointed down. In the station, the release bar will lift up and push on the horizontal bar, releasing the restraints. This allowed easier retrofitting of the PTC trains to existing roller coasters. 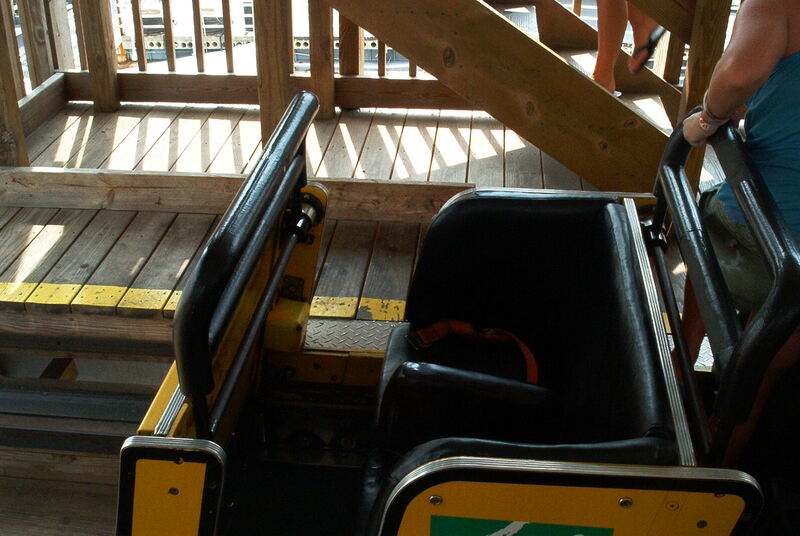 For the Voyage at Holiday World (Santa Claus, IN) in 2006, at the park request, PTC added a yellow metal pedal to the metal bar in front of the car. This allow easier restraint release in the station and during lift and brake zone evacuations. This became a standard feature on all PTC trains manufactured after with under car restraint release. This picture shows that style of restraint release and also the yellow pedal. This is the yellow train on Le Monstre. In 2013, Six Flags ordered a set of 4 trains consisting each of 6 4 passengers cars for Le Monstre at La Ronde (Montreal, QC). Those cars were ordered with high seatbacks, individual restraints with under car release/pedals, open seat dividers and for the first time since 1981, “Monstre Wings”. That term is one I invented to describe an additional safety feature, where foam covered pads are mounted on top of the car side in order to prevent passengers from stretching their arms out. This was necessary since the safety rules for passengers safety envelope have evolved since 1985 and the new cars were not grand fathered in like the old ones. Le Monstre feature many trips through the structure where the side clearance is not not to current standards. So, Six Flags ordered the same feature they have on the American Eagle at Six Flags Great America (Gurnee, IL). This picture shows the Monstre Wings and high seat backs. Mechanically, there are 4 different kinds of cars that PTC currently offer. They are offered with one to four rows of 2 riders per car. The number of rows per car as an effect on the performance of the car and a longer car may have more issues negociating abrupt turns. The most simple is the fixed chassis design. In that case, both axles are fixed to the chassis and so, in order to turn, the turn has to be wide enough and also have an angle change so gradual that the train will only have to flex a little to make it through. The Beast at Kings Island (Mason, OH) is one such example. It also had its trains shortened from 4 rows to 3 rows per car to help with the ride many turns. The second kind is the most common today, the articulated chassis. The back axle of each car can bank up to 3 degrees. That allow easier and quicker transitions from flat to banked track. The third kind is the type that was invented for the Gravity Group and now used on all their designs and retrofits like Le Monstre. It is an articulated chassis, but the back axle has a few more degrees of possible roll. The last kind is the rarest, the junior cars. Those 2 rows cars do not have guide wheels. Instead, they use flanged wheels similar to railroad wheels and they are articulated like their larger cousins. As well, they have the movable hand rail restraints which are mechanically operated with pedals at each car in most cases. KECO (Kings Entertainment Company) instead installed an electric release with solenoids like they had on all their wooden coasters. Ghoster Coaster at Canada’s Wonderland is one such example with the electric handrails. One last feature of the PTC cars are the two types of seat dividers. The first one invented was a steel frame covered in thick foam and leather. Later, at some parks requests, that divider was replaced by a simpler design where it is a plastic frame with an open center. This picture show the open seat divider. At IAAPA Attraction Expo 2015, PTCi introduced the new “PTC 360” trains. They feature a single row per car, a trailered design and compared to the previous trailered design they had tried, a perfect trailer hitch and bar. The front car of the PTC 360 with an open front and decorative front piece. The seat design, shown here with individual lap bar, open seat divider and seat belts. The bar that links the cars together. Originally known as the Dayton Fun Company and founded in 1919 by Aurel Vaszin, National Amusement Devices (NAD) began producing roller coaster stock for John Miller and other designers in the mid 1920’s. Known as “Century Flyers”, those large 3 rows cars had a stainless steel body and only had openings on one side for riders to enter and exit. The other side had the single lap bar per row locking mechanism. 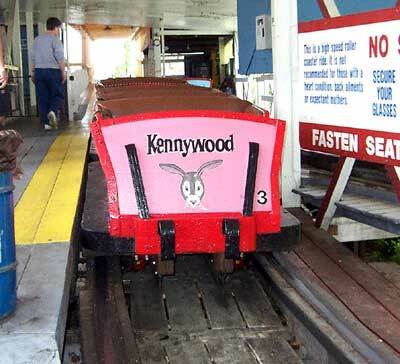 Kennywood (West Mifflin, PA) notably bought 3 trains in 1958 for the“Pippin” roller coaster. Those were kept when it was transformed into the Thunderbolt in 1968. The Century Flyers trains are heavy and non articulating. Those factors give a whole different ride experience than the other trains that sometimes replace them. The Blue Streak at Conneaut Lake Park (Conneaut Lake, PA) is a Edward Vettel 1938 wooden roller coaster. At some point, its two trains were replaced by NAD Century Flyers. In 2002, after the park restored one of the original Vettel they started to run that train instead of the Century Flyer. Then, in 2010, after Leonard Adams Structural Technologies Inc. took over the ride maintenance, the NAD train was brought back to life and is now gloriously riding again on the Blue Streak. 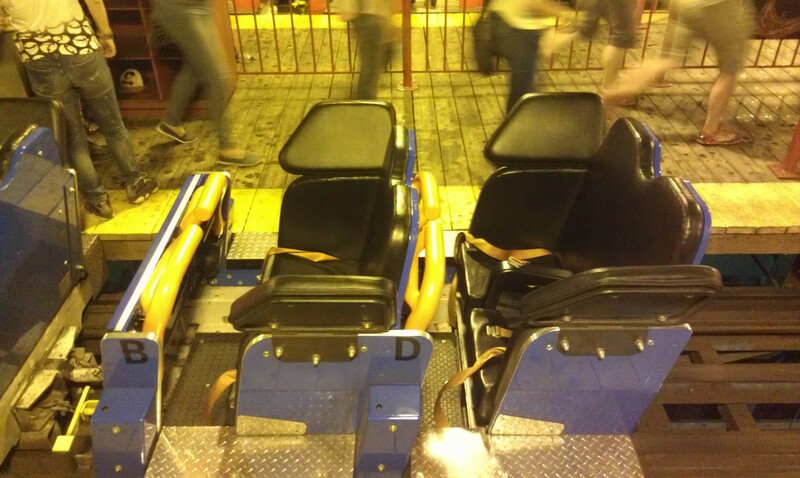 One of the Century Flyer car on the Blue Streak. In 1973, NAD was sold and became the International Amusement Device company (IAD). IAD only built two roller coasters before closing down. The IAD trains featured a bench seat, single position lap bar and a seatbelt. One of the two IAD train running on the High Roller at Valleyfair (Shakopee, MN). In 1920, Fredrick Church and his partner Thomas Prior started designing wooden roller coasters. His trademarks were severe turns and banked curves and for that purpose, he designed a new set of cars. They were single bench cars running on two wheels connected on the trailer principle. The coupler between cars were ball and socket joints, so the train could navigate the sudden turns that had a sharper roll than what the other cars offered on the market could negociate. The running wheels were also the guide wheels, since they had a flange in them, similar to railroad running stock. Little bars were also included in order to prevent the cars from lifting from the track. The most innovative feature was a small oil tank mounted to the front car. Two little tubes would run to the wheels and lubricated them as the train went around the track. The cars are probably the most comfortable ever designed, using what is basically a padded couch with a small lap bar that secure both riders. 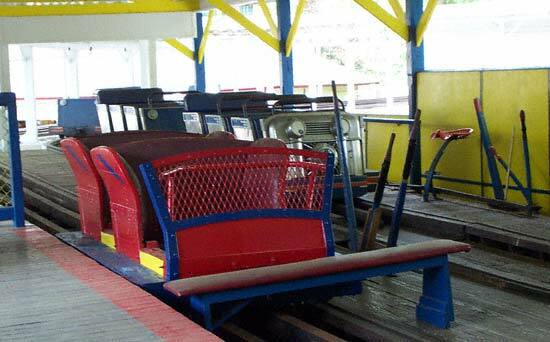 In 1929, he designed a two bench cars for the “scenic coaster” with gentle dips and turns he was contracted for the Playland Park in Rye, NY. The coaster was named the Dragon and those beautiful trains ran until the 1980’s. The ride still operate with D.H. Morgan trains. Only one original Church train still operate today, the “Ol Yeller”. That yellow train is currently operating on the Classic Coaster, which is installed on the Washington State Fairground in Puyallup, WA. It follows the calendar of the spring fair in April and the full Washington State Fair in September. The ride feature two additional trains, but those trains are park built copies of the yellow train. One more set of 3 “clones” run on the Coaster at the PNE (Vancouver, BC). Even through the trains were built for only 10 years, they inspired every coaster designer that came after. 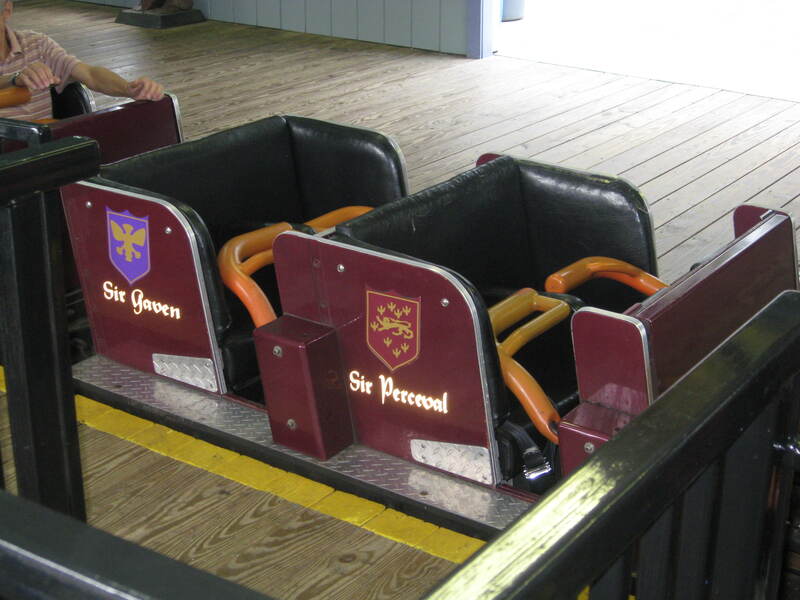 The GCII Millennium Flyers were updated versions of those and even steel coaster designers use the ball and joint design to flip riders around in barrel rolls and sharp curves. John Miller is a legend that need no presentation. He invented many safety features that allowed every coaster that followed to come in existence. Anti roll back devices on trains, upstop wheels, car assemblies can all be traced back to him. So, due to him holding those patents, every other coaster designer from the era worked with him at one point or another. His contribution to the wooden coaster cars were unique long wheel base trains. With 3 or 4 rows per car, they sometimes had open front and used seatbelts and a fixed bar to restrain riders. Over time, parks retrofitted PTC hand rail lap bars to some of them in order to fit with the current safety regulations. Edward Vettel was a roller coaster designed based in Pennsylvania and he became the head of maintenance at West View Park (West View, PA). While he designed 4 roller coasters for his home park, he designed 6 more for other owners. He designed and built his own roller coaster cars, which in some cases had a two bench configuration with a fixed lap bar, open front and seatbelts. He also designed the Jack Rabbit at Kennywood (West Mifflin, PA) three trains, which have 3 benches, closed front and fixed lap bars. 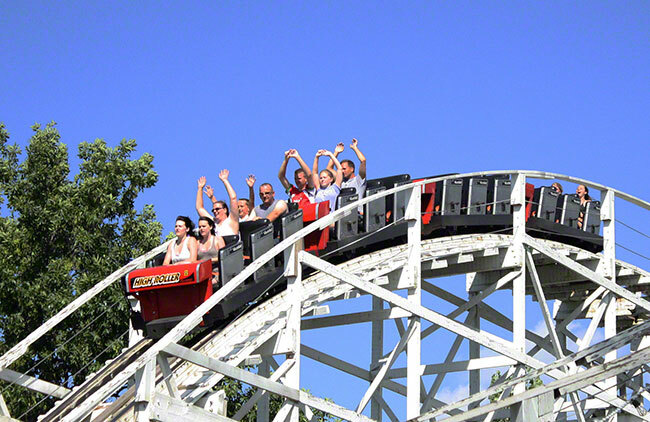 Currently, only three rides still feature his trains: the Lakeside Cyclone (Denver, CO), the Jack Rabbit at Kennywood and some years, the Blue Streak at Conneaut Lake Park (Conneaut Lake, PA). When his brother Edwin Vettel returned from Europe, he also became a head of maintenance, this time for Kennywood Park (West Mifflin, PA). His son Andrew took over after he sadly passed away and Andy Fettel was responsible for many of Kennywood iconic attractions, such as transforming the John Miller Pippin into the award winning Thunderbolt and rebuilding the classic Racer in the 1940’s. The front car of the Vettel train on the Blue Streak at Conneaut Lake. The front car of the Jack Rabbit. When CCI did a refurbishment of the La Montana Rusa at La Feria de Chapultepec (Ciudad de Mexico, MX) in 1993, it it through that the the ride Century Flyers were modified by Custom Coasters International (CCI). New bodies were laid on the base of the Century Flyers and new padded seats added. Individual L lap bars and seatbelts were the restraints installed. Interestingly, no seat dividers were placed and so, it is a bench seat with individual restraints. 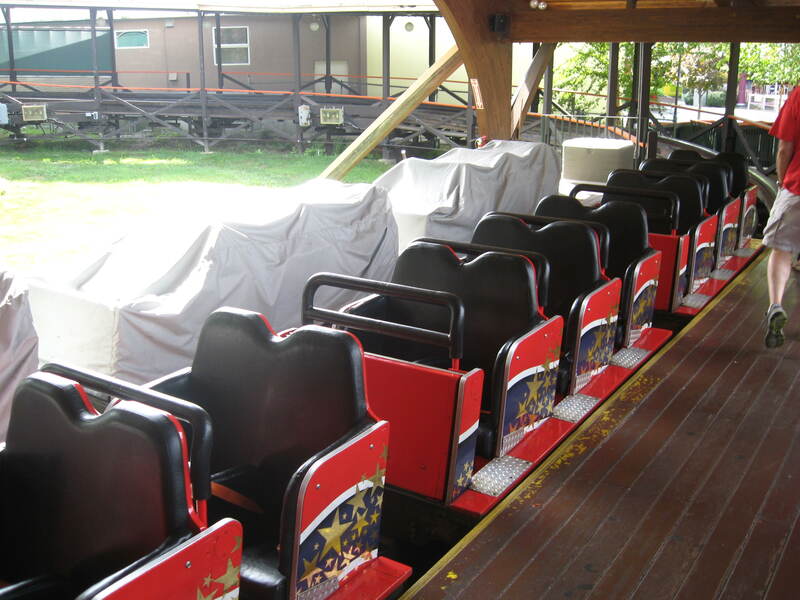 This picture show the current restraints and seats on La Montana Rusa. In 1994, CCI renovated the Screeching Eagle at Americana Park (Middletown, OH) and at the same time, changed the train. The train was designed and built by CCI and was met with mixed reactions from the park and riders. The main issue were the unpadded L individual lap bars that had no ways to keep them from tightening up uncomfortably on riders. Plus, the release mechanism did not work well and the lap bars were not released reliably. Soon after, the original NAD running gears was mixed with a used PTC 3 bench cars body from the Elitch Gardens Wildcat to give a unique hybrid train. The CCI train then showed up in 1996 on the CCI junior wooden coaster Pegasus at what is now Mt. Olympus theme park in Wisconsin Dells, WI. The train also did not last long on that one and was scrapped after. A standard articulating two benches PTC train with four cars and ratcheting lap bars replaced it. In 2002, CCI introduced a new kind of wooden coaster. It replaced a traditional dark ride and thus, required a new kind of cars capable of going through tight turns. CCI came up with a small compact car where 4 riders sit in two rows that face each others. Individual seat belts, a fixed lap bar and netting around the car serve as restraints for riders. The car itself has a short wheel base with 4 sets of wheels that can all individually move, in order to navigate the tight turns and drops of the ride. So far, the only ride with those cars is the Lost Coaster of Superstition Mountain at Indiana Beach (Monticello,IN). This entry was posted in Coasters and tagged Coasters, Rides, Wooden. Bookmark the permalink. ← Wooden Coasters: braking systems Part 1.